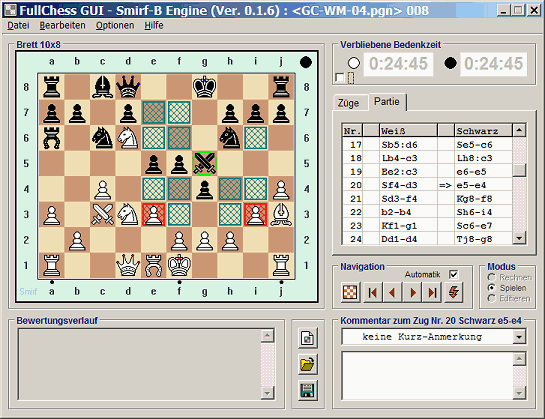 This page is written by the game's inventor, Reinhard Scharnagl. skip spositions that have unprotected pawns or violate any patent. castlings are (like in traditional chess) only valid if neither the affected king or rook has been moved, or there would be a need to jump over any third piece, or the king would be in chess somewhere from his starting position to his target field (both included). Therefore all squares between king and its target square (included) have to be free from third pieces, same applies to the way the rook has to go to its target square. 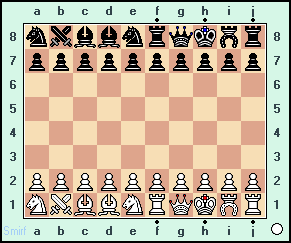 the alpha-castling (O-O-O, White's left side): like in FRC the king will be placed two rows distant from the border (here c-file) and the rook at the next inner neighboured square. the omega-castling (O-O, White's right side): like in FRC the king will be placed one row distant from the border (here i-file) and the rook at the next inner neighboured square. if a castling enabled rook is not the most outer one at that side, the letter of his file has to be placed immediately following his castling marker symbol, where 'q'/'Q' are used for the alpha-, 'k'/'K' for omega-side. 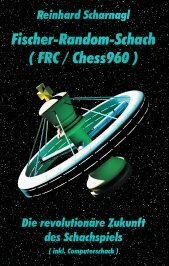 f) engine notation rules for castling moves: According to UCI convention the castling moves should be written by using both coordinates (source and target field) of the involved king. But there are castlings, where the king does only one or none simple step. In that cases the castling should be distinguishable by appending a 'k', like already practized in promotion moves to make them unique. Overmore an engine should accept O-O or O-O-O (no zeroes), but only use them, when the GUI would demand for such a less precise notation. Webpage created: February 24, 2005. Webpage updated: October 6, 2018 by Greg Strong. In the case of a real free castling there is the possibility to also have castlings, wherein the king is making only one single step. Then an encoding as e.g. 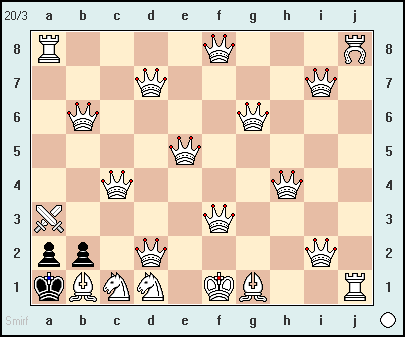 Kd1 is not sufficient to distinguish a castling move from a simple King's move. Moreover in traditional chess O-O and O-O-O is used. Thus the representation should be very related to that. using O-O-x has more common parts to those traditional forms than O-x. Thus I am preferring that. By posting here I intended to investigate the status quo of writing down castling moves in variants, before I would start to implement such abilities in SMIRF's successor application Octopus. Hi Sam, there seem to be different kinds of free castling, thus including one-step-castlings. This is one reason and another, because a castling should be obviously in its notation Thus I would prefer adaptions to the classic notation. Another question is, that a GUI should be more flexible in accepting several kinds of notations. Nevertheless I try to unify such notations into a common mimic. For my own Schoolbook chess, which supports free castling, I just notate a castling move as the square the king moves to; for example, Kc1. Where the rook moves to is determined by where the king moves to, and the only time the king can move more than one square is when he castles, so this notation is unambiguous. I suggest notating is as a King's move. Like 'Kb1'. This is a standard way to notate normal castling, btw.